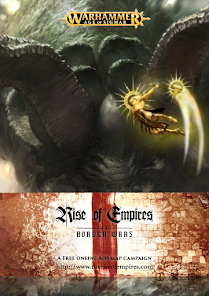 Today I have a special feature on the creator and Hobby and conversion hero Ex Profundis. 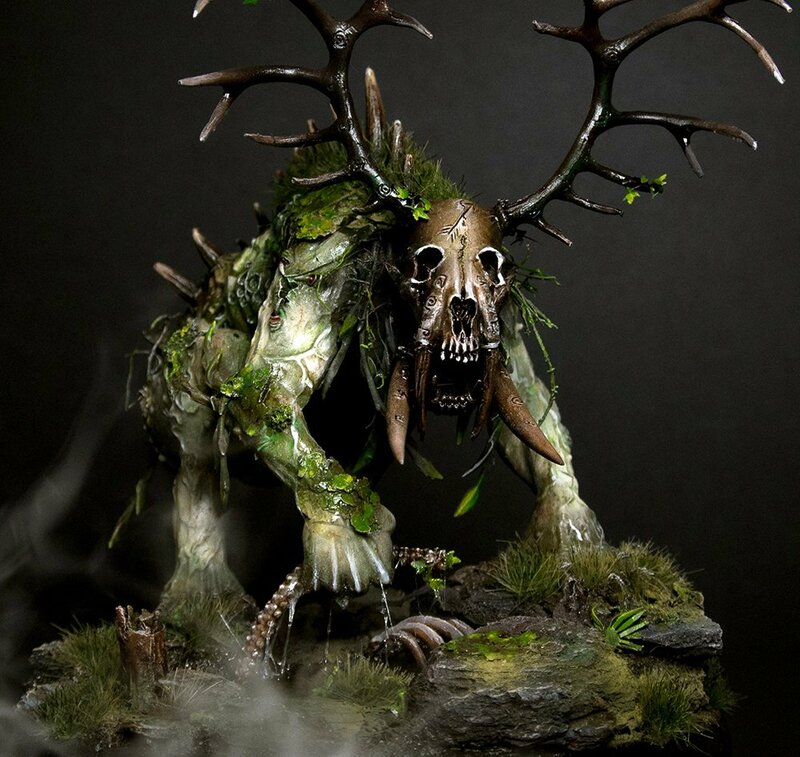 I talk to him about his AoS28 project and his warband, the corrupted Nurgle army. I hope you enjoy and leave any comments below as always! Sean: Hi Dude, how are you today? Introduce yourself to the masses. Jake: Hello everyone, I’m Jake from Ex Profundis. 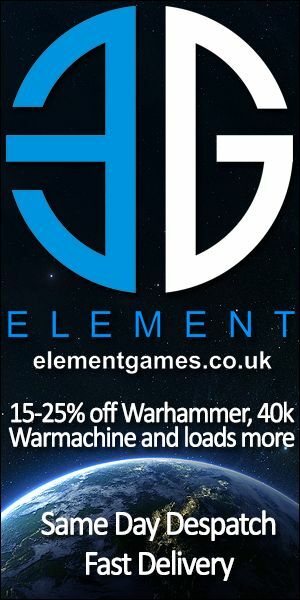 I was a Warhammer fan in the 90s and got back into the hobby about five years ago when I was roped into a Necromunda campaign. I was mostly interested in Necromunda and Inquisitor until Age of Sigmar was released, and since then it has been my main focus. Jake: My favourite thing about Age of Sigmar is the post-apocalypse sandbox setting: so much of it is unexplored and you are free to do with it as you please. 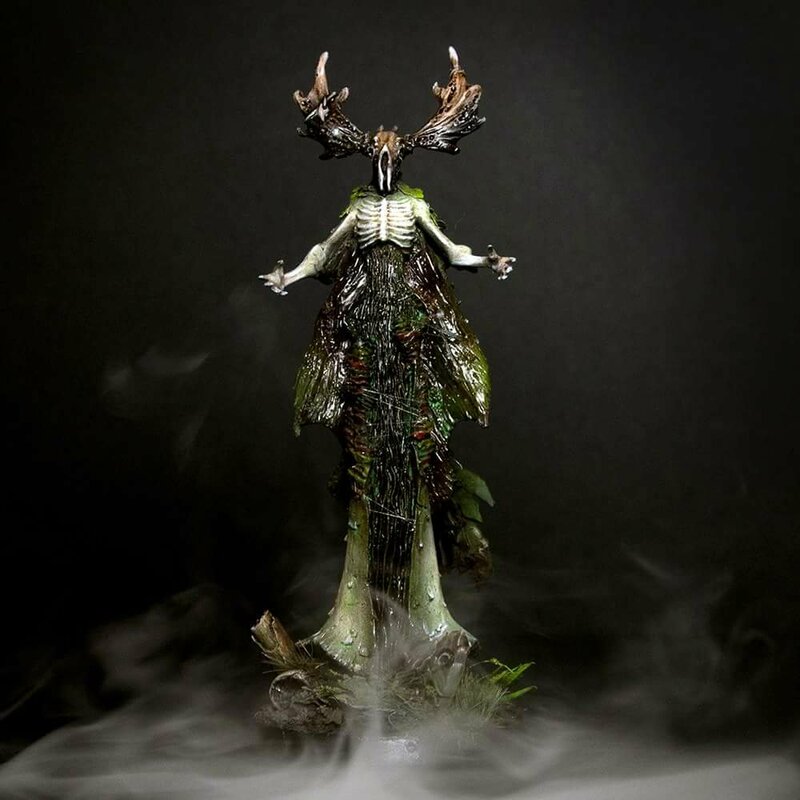 The idea for this warband came about by trying to imagine what this nightmare setting would have done to a group of Wood Elves. They are swamp aelves hiding in a rotten wood while the world outside has fallen to Chaos, their own gods have abandoned them and now they worship something else; something that is just as lost and wretched as they are. Sean: So I have done this Showcase on you which is slightly different as I am focusing on your warband rather than just one unit. 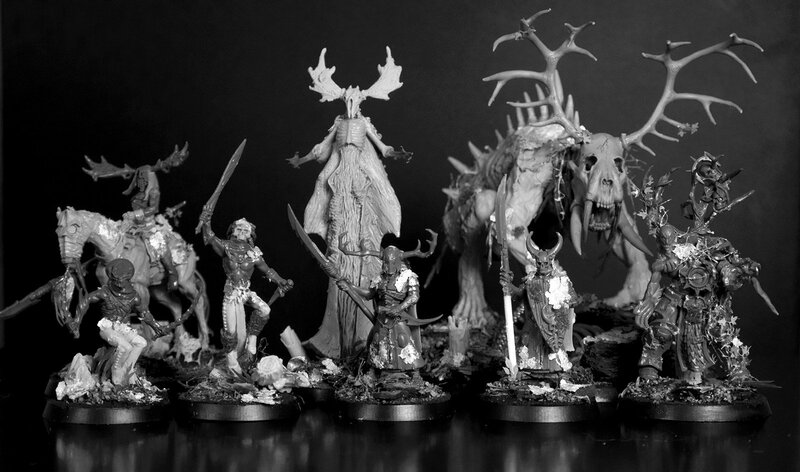 Tell us about the idea and how the warband came together? Whats the background of AoS28? 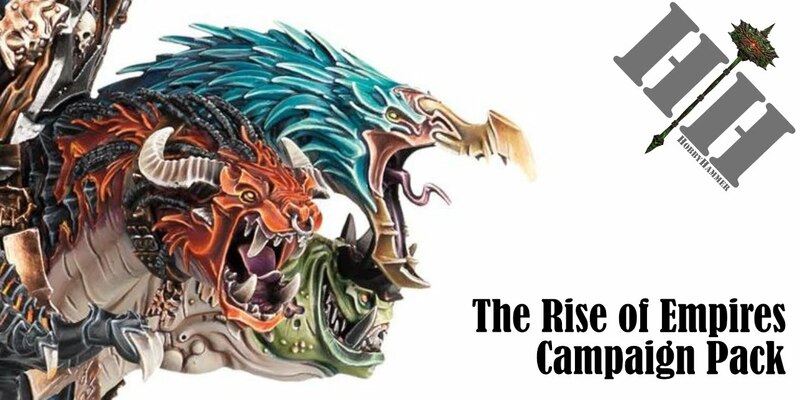 Jake: AoS28 (The Dark Age of Sigmar) is a name I gave to an idea that has been around for a while - it’s just really about creating fantasy miniatures that tell a story, preferably a dark story! They aren’t necessarily made for gaming or part of an army, they may not even have rules, but they have a lot of individual character. In the 40k setting people have been doing this sort of character-driven thing for a while with Inq28 which is mostly about making Inquisitor warbands. These are some of my favourite models: they are imaginative and a break from all the Space Marines armies! AoS28 is just the fantasy equivalent of this. It’s not an original idea – Mordheim was something quite similar for the Old World - but it is a darker take on Age of Sigmar that we haven’t seen much of so far. Sean: How long do these take to convert? If we took the Treelord as an example. What and how many bits are used to create this? Jake: The Treelord is the centerpiece of the group. He’s made from a couple of Forgeworld kits - a Greater Chaos Spawn and an Incarnate Elemental of Beasts. I love Forgeworld kits and was lucky enough to be gifted the Elemental after it went out of production. I knew I wanted to use the incredible skeletal animal head it has but I hadn’t planned much further than that. I think the model came together after a lot of experimenting with parts and blutack - the combination just looked right and the rest of the conversion was easy - a little reposing and some rough sculpting. I tend to work quickly and quite messily, for me the main difficulty is getting the idea out before I lose interest in it. I don’t tend to paint the same model for more than a few hours, there is always a new idea that I’d rather be starting! Sean: I especially love the guy on horseback? Does he have a name and backstory? Jake: The aelf on horseback is a Wild Rider - I wanted to include the most familiar units in the old Wood Elf range so that I could show how they were changed by this Chaos apocalypse. He was the last model to be completed, it took a while before it clicked - most cavalry models were too dynamic and I wanted something static and foreboding. He doesn’t actually have a name but some of the others do and have been featured in some short stories on my site, like the Spellweaver. Sean: What is your recipe for the sickly forest green? Jake: The Spellweaver is the most corrupted member of the warband because he has been communing with their new god for too long. I usually try to use 100% Games Workshop parts but the base miniature here is from D&D and was just too perfect to miss out on. The fungoid body is very Lovecraftian. 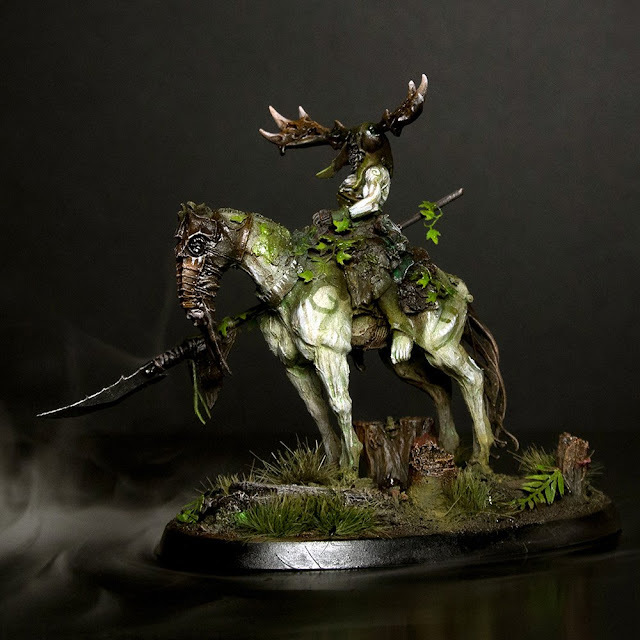 I love the idea of this rot and fungus infecting a once beautiful elf – corrupting them all until they have to wear masks because they are ashamed of what they have become: it’s quite different to the gleeful decay of Nurgle. Sean: Also the guy raising from the ground is really cool, the body looks very fluid, how did you achieve this? Also how do you get that smoke effect? Jake: The warband ended up a lot brighter than I had intended: the original plan was to paint them without using green at all, but after finishing a black and white Chaos force I was desperate to add a little colour here. They are mostly airbrushed and the green stands out a lot due to strong contrasts with black and white. I’m afraid I don’t remember the recipe but there is a tutorial on my site. The smoke effect in the photos is actually from a homemade ultrasonic mist maker. Jake: I don’t know what the AoS scene is like in my area, I’m yet to play a game. Although I don’t game much, this warband has been designed with Hinterlands in mind (or possibly Age of Sigmar Skirmish or even Shadespire) and they will also likely be used for games of Warhammer Quest. But primarily they were made just for the sake of creating cool characters. Sean: What is next on the project table for you? Jake: I’m currently working on a Warhammer Quest setup with various characters and NPCs and monsters. Plus a Witch Hunter for the Eclipse AoS28 competition. Oh and a Harlequin warband for Shadow War: Armageddon. Sean: Is there anything else you would like to promote? Jake: I’d encourage anyone that is interested in this sort of thing to check out the AoS28 Facebook group. It has grown very quickly and it’s full of great miniatures. Sean: Thanks for your time dude!